Storybooks Canada – Polish translation available! Storybooks Canada – Polish translation and audio recordings are now available! Stor ybooks Canada is a website for teachers, parents, and community members that aims to promote bilingualism and multilingualism in Canada. It makes 40 stories from the African Storybook available in the major immigrant and refugee languagesof Canada, in addition to the official languages of English and French. A story that is read in English or French at school can be read in the mother tongue by parents and children at home. In this way, Storybooks Canada helps children to maintain the mother tongue in both oral and print form, while learning one of Canada’s official languages. Similarly, the audio versions of the stories can help beginning readers and language learners make the important connection between speech and text. 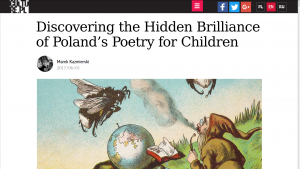 Posted on August 31, 2018 September 29, 2018 Categories Helena G. Kudzia, language, literature, Polish Studies, Polish Studies: Language, Literature and FilmTags African stories, basnie, children, dzieci, Storyboks Canada, UBC VancouverLeave a comment on Storybooks Canada – Polish translation available! … Just think about what they do – the non-physical thoughts and emotions of the writer are converted into sound (the basic form of language), then pictures (letters started out as pictograms), then infinitesimally complex sequences of words, sentences and paragraphs, which are then printed on cut-down pulped trees so that countless others can use the light flying in from the nearest star, bouncing off the page and inside their eyeballs, to convert their reflection into the same thoughts and emotions the writer was feeling at the time of writing… or, as is often the case, the very opposite to what the writer wanted the reader to think and feel.